Having read plenty on the subject of hydration relating to exercise, I thought I'd write a high level discussion about it, based on the controversial conclusions from Professor Tim Noakes' book, 'Waterlogged: The Serious Problem of Overhydration in Endurance Sports' as well as my own personal experience and that of friends and coaching clients. His previous book, 'The Lore of Running' is like a bible in the exercise science world and has been very helpful to me in everything I do within the running world. With temperatures starting to warm up and races like the Marathon des Sables (article about how to train for the MdS) in the Sahara Desert around the corner I thought it's a topic that could hopefully help some runners to avoid bad races, based on advice from the book and my own experiences from 170+ ultras and marathons across the world. One thing I've noticed a lot since I started coaching a couple of years ago is that almost everyone in the world of sport clings to the idea that athletes must remain 100% hydrated to not suffer from a drop in performance. The sports' drink industry has put countless millions into marketing this idea and telling people that 2% dehydration (presumably 2% loss of body weight due to sweating) can seriously affect performance and should be avoided. They backed studies to show that losses in excess of 5% of body weight can decrease the capacity for work by about 30% (Armstrong et al. 1985; Craig and Cummings 1966; Maughan 1991; Sawka and Pandolf 1990). This is advice I assumed to be unbiased and effective so I followed this advice in one of the first ultras I ever ran, the Marathon des Sables in 2006. Unfortunately, I'd never heard of hyponatremia, an electrolyte disturbance in which the sodium concentration in the blood serum is lower than normal from drinking too much. So I drank virtually every drop of the 9Ls (304 ounces) of water provided per day by the organizers and found myself fainting twice on day two as the symptoms started to affect me. 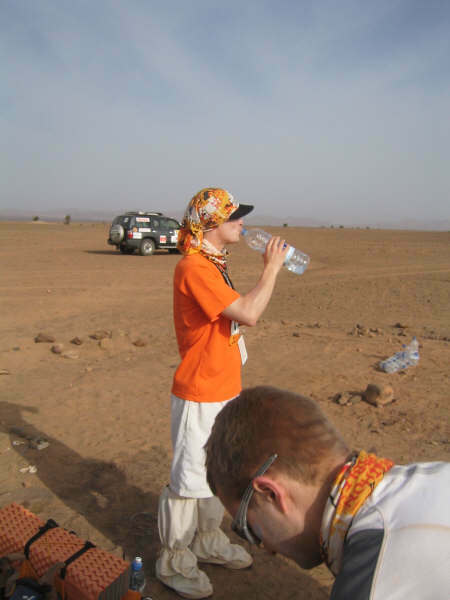 So after that experience I certainly questioned the general advice at the time to drink as much as you can to stay hydrated. I've never heard anyone mention the dangers of drinking too much, yet when you hear about a death at a marathon or half marathon, more often than not over-drinking. Considering how dangerous it is to drink too much during a race, surely the dangers of drinking to little must be equally as severe? When Professor Tim Noakes published his book on this subject last year, 'Waterlogged: The Serious Problem of Overhydration in Endurance Sports,' I knew he'd have a thorough review of all the evidence without any pre-existing prejudices or corporate sponsors wanting a bias to the conclusions. Bear in mind that Gatorade and the Gatorade Sports Science Institute (GSSI) funded much of the research on this subject with a clear interest in telling people to drink lots. His book is more than thorough, looking at every single published study on this subject that he could find in all scientific journals, including all those written by the GSSI. 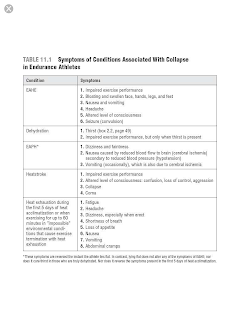 There was a striking common theme amongst these studies that either examined the effects of dehydration on performance or the effects of exercise-associated hyponatremic encephalopathy (EAHE). It was that dehydration levels seen in an ultra or Ironman race (never mind a marathon or less) don't reduce performance and many of the studies had conclusions that were the opposite of what the evidence they presented showed. This is particularly worrying because the guidelines produced by the American College of Sports Medicine (ACSM) still provides guidelines that suggest dehydration is the main worry for athletes, not the effects of hyponatremia. US races therefore still urge runners to drink too much, although I'm noticing more of them start to tell people that drinking too much can be dangerous too, but that's not the focus of the advice. 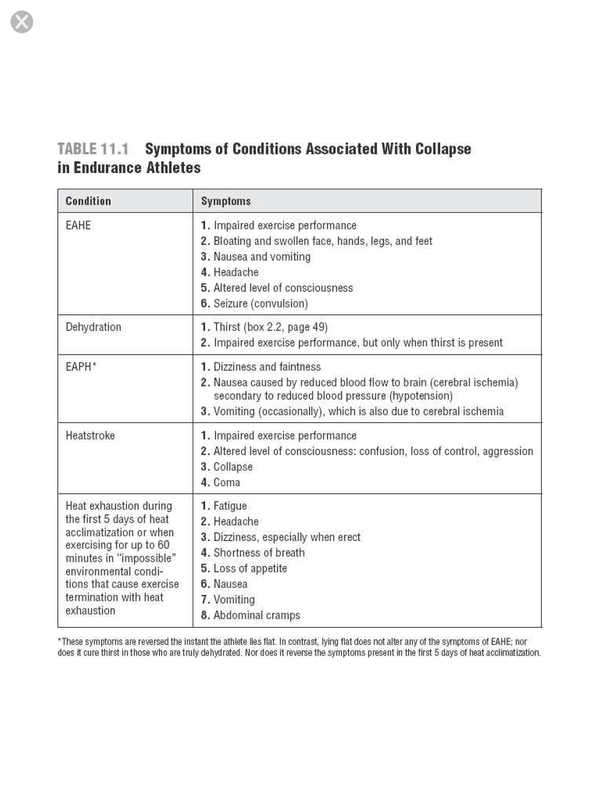 EAHE is a much more serious danger than dehydration in races and the percentage of people having medical issues in races has increased as more people follow the advice of drinking to maintain body weight during exercise, with the major cause (based on the clearly defined and explained symptoms in Professor Noakes' table below, backed up with extensive evidence from his book). The striking point is that the main symptom of dehydration is thirst and it's only when an athlete feels very thirsty that performance can be reduced. The old advice of ignoring the body's thirst mechanism and trying to stay ahead of thirst by drinking to maintain body weight is a load of rubbish. The clearest evidence of this is that in the many high-level races where body weights were taken before and after for lead runners and people running more slowly, the highest levels of dehydration (biggest percentage of body weight lost) were found in the leaders with the winner almost always being the one who lost the most body weight percentage. So if losing any water through exercise reduces performance, how come the best performers are the ones who lose the most (as a percentage)? The evidence suggests the ability to run while 'dehydrated' is an attribute of a top athlete, not a reason they fail. From my own experiences in marathons and ultras, as well as those of people I know and coach, I'm not aware of anyone having their performance reduced from dehydration except Kilian Journet in the 2010 Western States 100 where he ran without water bottles in extreme heat and lost the lead to finish third. Even in that instance, heat-stroke probably played a large part, not just dehydration (see next section for more details). In every other instance I can think of, dehydration has not been a problem as long as drinking to thirst was adhered to. I've run some of my fastest marathons on barely more than a couple of sips of water (in cold conditions) but I wasn't particularly thirsty on those days in those temperatures. On the other hand, I've suffered from drinking too much at both the Marathon des Sables (desert) and Western States 100 (extreme heat). 1. Body temperatures rise more in higher intensity, shorter forms of endurance running such as 10ks or below - the chance of heatstroke is much higher in these than in a marathon but a very hot day can cause this too (think Western States, not a 70F road marathon). 2. Importantly, drinking has a very minor effect on cooling the body although iced water would have marginally more effect. Getting into the shade or an ice bath is the only effective way to reduce body temperatures fast in a race and have an effect on heat-stroke. Again, personal experience suggests this is true. I've crewed for people at Badwater 135 through Death Valley where temperatures can hit 130F and external cooling like ice baths helped my runner while constant drinking only served to quench thirst. It certainly seems that heat-stroke is more likely to happen to ultrarunners than dehydration, particularly in the exposed sections of extremely hot courses. However, drinking alone won't help much here and use of ice and water externally will make much more difference, as well as adjusting effort levels to reduce heat produced in the muscles. Another commonly-assumed piece of running lore is that as a body exercises, electrolytes are lost and must be replaced. This is a reason to drink Gatorade instead of water and therefore pay Pepsico (owners of Gatorade) for their product. Yet Prof. Noakes also examined this area using all the evidence available as well as his own research. In summary, he found that the body is very good at regulating electrolytes and that the levels lost in sweat and urine are adjusted by the body based on exertion and liquid intake. He basically says we don't need to try to replace these with drinks or salt tablets. That sounds counter-intuitive as most runners will have experienced cramps or bonks that were seemingly fixed once they took on electrolytes. However, he goes on to show that cramps and bonking are unrelated to salt/electrolyte intake and are really affected by exertion levels above what the body is trained for (something that will typically happen in an ultra given its extreme nature) or a lack of fuel in terms of glycogen. That means that getting energy (not salts/electrolytes) into the body combined with lower effort levels such as walking for a while are what fixes these problems. Given that most runners have to slow down and will eat as well as take salt tablets, the effects can get muddled and improvements attributed to the wrong factors. Sports drinks do have glucose and there's no doubt that taking this on board in endurance activities is beneficial. At least Prof. Noakes didn't burst that bubble! I found the book to be very illuminating but it won't alter my own tactics in races much, mainly because I don't tend to over drink since that means carrying too much liquid between aid stations in an ultra which therefore weighs more. I will be more careful in trying to identify and stop the causes of things going wrong in a race such as Western States. In fact, I'll use the mantra of drinking to thirst rather than aiming for a certain volume of liquid per hour. Sports drinks are still good for athletes, we just don't need to drink as much since hyponatremia is a bigger worry than dehydration. Also, I'll still take on electrolytes within drinks because they haven't been shown to cause any harm, so even a placebo effect is useful. Besides that, electrolytes are usually bundled with calories in the form of glycogen in drinks, but any low calorie drinks will be off my list during races and I'll stick to my Clif Shot Electrolyte drink because it has calories and sugars (basically, glycogen). If the electrolytes help then that's a bonus, but it seems the calories will do the job anyway and I won't aim to take on extra electrolytes in tablets etc unless things go really wrong - it's worth trying anything at that point. For food during races, gels and similar products will still be the basis of my own nutrition (Clif Shots) to provide the energy required to sustain a long endurance effort. However, the place for salty foods isn't so much to replace lost salts as to provide a change in taste after hours of sugary foods during an ultra. It helps to learn more about the way the body works during exercise so that errors can be avoided or minimized as well as successes being better understood. might I suggest checking your font colour, or your choice of colour used to highlight the text. All I see if blocks of white. But it could be just me. Thanks - fixed it now. I have adjusted my own hydration strategy following reading Professor Noakes' book and have found it to work really well. I no longer drink for drinking's sake but drink to thirst as his mantra suggests and have not really had to worry about electrolytes since. I don't bother with drinking at all on anything less than an hour. I ran a 50 miler on Saturday at race pace and lost about 8.5 lbs (6% body weight), but felt absolutely great at the end. Didn't have to replace any electrolytes and didn't bonk at all. I agree that it helps to understand how your body works, and hopefully this will help me to improve my race times. Honey water is my best friend. Great post Ian with some fantastic points. 30 yrs of marathons and ultras have formed some pretty hardwired ideas, but Dr Nokes makes some strong statements that make enough sense to at least rattle "the world is flat" population of runners, to which I am a long time member. Thanks for stirring the pot. Run long and strong. Great read. Really useful to understand the differences between heat exhaustion and dehydration. I'm running WSER for the first time this year and it is the heat that has me worried (from UK when such temps would create national panic!) so very helpful advice. Thanks. Only issue is that WSER still have their weigh in process so even if you are feeling great an drinking to thirst they can still pull you from the course i your weight drops by his7%. Great blog, thanks! I have been a fan of Prof. Noakes for a while now... You wrote: "Sports drinks do have glucose and there's no doubt that taking this on board in endurance activities is beneficial. At least Prof. Noakes didn't burst that bubble!" YET !!!! Prof. Noakes is preaching low-carb diet for runners so that's the next bubble he is going to burst!!! I have been eating low-carb for two years now with great results. So, no Sports drinks or glucose for me when running... even 100 milers.